There’s no beating around the bush with the first single off AlfanAnt’s forthcoming "Aurora Australis" album, 'Head In The Cloud'. The easy-breezy ditty with infectious harmonies, great guitar picking and sweet songwriting belies the underlying meaning—expecting everything to change, but doing nothing about it. 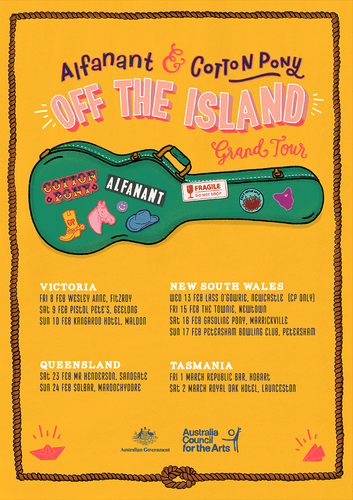 The new single, which recently premiered on Double J's Stir It Up, comes twofold with AlfanAnt hitting the road on their ‘Off The Island’ 11-date tour with Tassie act Cotton Pony, supported by the Australia Council For The Arts. "We have our head off in the clouds even though we are running full pelt with our eyes closed expecting that everything will be alright…"
Alongside Alf and Ant, Yanto Browning (Airlock Studios and QUT music guru) also makes a guitar appearance on the track as well as taking engineering credits. ‘Head In The Cloud’ is the first release from the 11 track LP due out later in 2019. AlfanAnt’s song ‘Comes A Time’ off their debut EP "Lucky" was awarded a finalist position for the Blues & Roots Song of the Year category in the 2018 Queensland Music Awards. The EP also spent over 2 months in the triple j Unearthed charts with "Your Kind" hitting #1 Roots, #4 Rock and #6 Overall and ‘Comes A Time’ and ‘Lucky’ also joining "Your Kind" in the Top 5 of the Roots chart. "Harmonies in the intro and a solid rockin' blues band—boy! you sure know how to make a lady smile! This track makes you feel like a cowboy badass!" - Nkechi Anele, triple j Roots n’ All Presenter on "Your Kind"
AlfanAnt’s cheeky nature that features so naturally on ‘Head In The Cloud’ is contagious and part and parcel of their live shows. Join them on the road for a tune and a yarn on their 11-date ‘Off The Island’ tour, hitting VIC, NSW, South-East QLD and TAS this February and March.